Hoo Doo (2018) my latest release is now available at CDBaby.com and iTunes. It features my band Sola along with guest vocalist Tondrae Kemp and drummer Angelo Stokes. Any attempt to pigeonhole jazz keyboardist and composer Michael Cain is bound to end in frustration. As a sideman, the 49-year-old Los Angeles native has worked with a stunningly diverse array of artists, among them Meshell Ndegeocello, Ravi Coltrane, Robin Eubanks, James Newton, Greg Osby, Dave Holland, the band Steps Ahead and, most notably, the legendary drummer Jack DeJohnette. As a leader Cain has released “a string of thoughtful, provocative releases,” as JazzTimes magazine put it—more than 10 albums in all. He’s produced recordings for Ron Blake and others and, for more than two decades, has served as a valued, pioneering educator, presently for the School of Music at Brandon University in Manitoba, Canada. He’s performed all over the world, working with everyone from Pat Metheny to the Jose Limon Dance Company, and has composed music for film and theater. Michael Cain is one productive guy. Sola (Native Drum Productions), Cain’s newest project as a leader, brings all of this artist’s creative gifts together in one consistently exhilarating set, eight brilliantly rendered pieces, all composed by Cain. Six of Sola’s tracks were recorded in Las Vegas (a familiar environment where Cain spent much of his childhood) with one band, a sextet, while the other two were cut in New York (where he lived in the ’90s) with a trio featuring bassist James Genus and the legendary drummer Billy Hart. Sola follows 2011’s similarly titled Solo, and in some ways builds upon themes first suggested in the earlier project. Sola begins with three tracks from the Vegas sessions, recorded at the city’s Tone Factory. 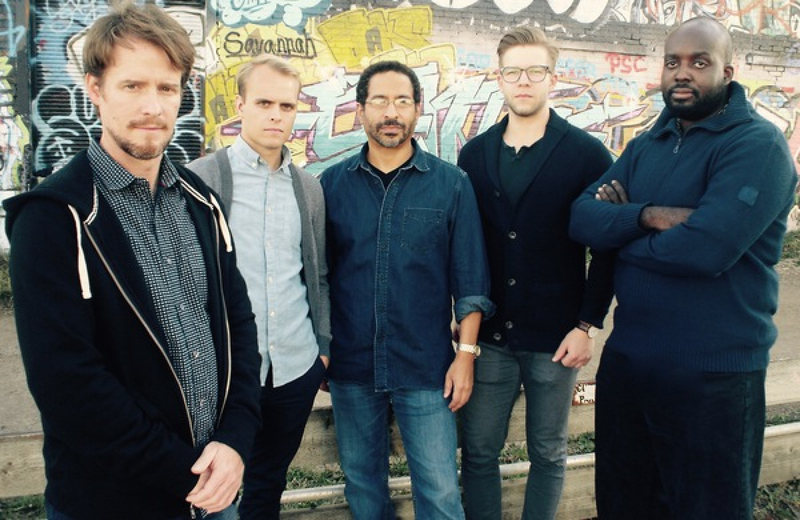 Collaborating with Cain, who handles all keys and programming, are bassist Abo Gumroyan, drummer Renaldo Elliot and a three-piece horn section consisting of Mike Gonzales on trumpet, Julian Tanaka on clarinet and Eddie Rich playing saxophone. The opener, “Orun,” its title from the Yoruba word for sun, “is a welcoming song, asking for blessing and giving thanks,” says Cain. “It’s a song of joy, praise and blessings. It starts the ritual.” The next track, “Esu Dance (Traditional)” spotlights trumpeter Gonzales, and “is largely inspired by the profound and important book by Henry Louis Gates, The Signifying Monkey,” says Cain. “In the Front Door” includes the sampled voice of the late trumpeter and bandleader Gerald Wilson, in whose band Cain played while living in L.A. in the ’80s. “He was a friend and mentor to me and he communicated a lot with the sound of his voice and his choice of words,” he says. “So this piece is about Gerald, African-American history, and Vegas history. The next three tracks take us back to Vegas. The title of “Wogg” is short for golliwog, says Cain. “These days the music I listen to the most is EDM and rap, by far. When I’m in Vegas during the summers I’ll go downtown and listen to the DJs all night long. I don’t like to try to imitate things in my music but I do hear the EDM influence in this one, although the horns are playing what I would consider an African melody.” The pace of “No Se Fia” is more leisurely, “and it’s all about space,” Cain says, “about the subtle tensions in the slow rhythms. Hopefully, it retains a quality of beauty as well.” For “The Sin You’ve Been Looking For,” Cain employs “a lot of subtleties of rhythms, and an ever-expanding tapestry of some subtle and not so subtle sounds.” The track features a terrific clarinet solo from Tanaka and segues artfully into the final track, “My Moyo,” another trio cut from New York. “More than this piece being about us playing a nice jazz ballad, I wanted it to evoke the feeling of a time and place,” says Cain. “One of the reasons the piece remains so easy and relaxed is because I want the listener to have space for participation, and if we fill it up with our musician story and our playing the whole time it can take away from that." *Ron Blake's Shayari, for Mack Avenue Records. This recording features Christian McBride, Jack DeJohnette, Regina Carter, and Gilmar Gomez. "Traverse" and "Capsule" for Brian Landrus, a wonderful bari sax and bass clarinet player. These recordings featured Rudy Royston, Nir Felder, Billy Hart, and Lonnie Plaxico among others. "Rebirth of the Cool" Winnipeg trombonist and composer Jeff Presslaff's new recording featuring new music written for the same instrumentation of the original ensemble of the classic Miles Davis recording, The Birth of the Cool. Other recent releases are The Green Eyed Keeper (2009), Solo (2011) Sola (2016), and Hoo Doo (2018) and are available through CDBaby.com and ITunes.